Most of us have received automated text messages at some point in our lives, and most of us find them to be a bothersome. But sometimes these robo-texts are violating rights as well. An Uber class action lawsuit in Austin filed by Terry & Thweatt, P.C. addresses one of these situations right here in Texas. Where is the line drawn when it comes to annoying mass-texts? There are acts and laws in place to protect cellphone users from certain mass-texts, and Terry & Thweatt, P.C. believe these rights have been violated by the Uber robo-texts. 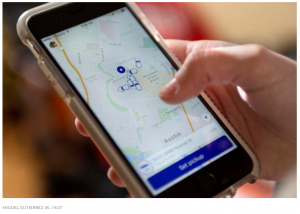 Austin residents were sent mass-texts over ride-hailing regulations ahead of the Proposition 1 vote. The text urged recipients to vote for Proposition 1, but our client argues these robo-texts violated the Telephone Consumer Protection Act. The suit claims the texts violated the law and users’ privacy by sending unwanted contact about political campaign matters. The suit was filed on May 4 and asks for $500 per violation, $1,500 in damages for each willful violation and attorney fees. Attorney Lee Thweatt filed on behalf of an individual who received the texts and is helping her pursue the fines and damages in the class action lawsuit. Terry & Thweatt P.C. represents a variety of cases, including offshore injuries, personal injuries, business litigation and more. Our attorneys are knowledgeable and persistent in fighting for the best possible outcome in every client’s case. Call 866-870-0008 or fill out our online contact form for more information or to schedule a consultation.